I received my Creative Memories new product shipment a couple of days ago, and am having so much fun playing with all the gorgeous new items! They will officially be released on March 1st, 2012, but I will be sharing a sneak-peek with the particpants at my upcoming retreat next weekend and with all my Calgary-area customers at my open house workshop the weekend after! Buuut...since one of the products - the Cricut Divine Wedding cartridge - has already been released by ProvoCraft, I figure I can share it with you all here! 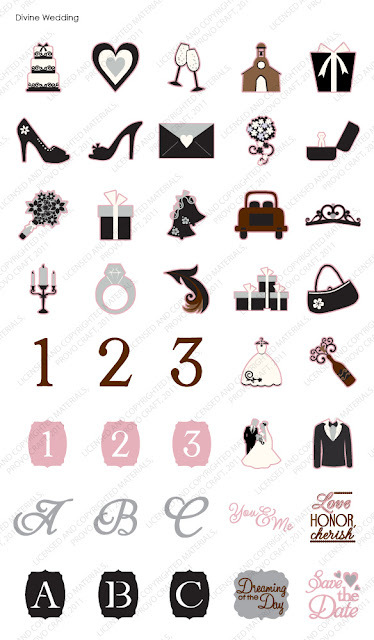 This cartridge is filled with beautiful wedding images, word art, shapes and fonts. There are 6 Creative Features including Layer/Shadow, Phrase, Phrase Shadow, Just Married Font, Wedded Bliss Font, and Monogram. 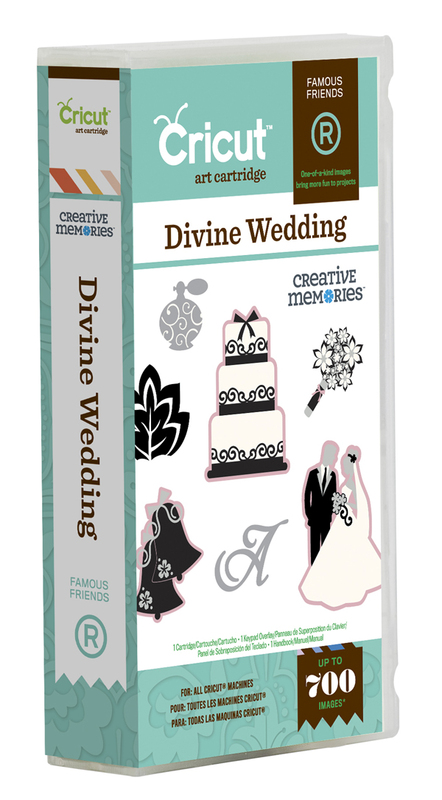 Use the cartridge in conjunction with the new Creative Memories Divine Power Palette to make one of a kind wedding invitations, place settings, thank you cards, and other decor projects, not to mention scrapbook pages to remember your love story once the big day has passed. Even though Provocraft released the information about and images of the cartridge, you won't be able to buy it anywhere else except from a CM consultant! Once the cartridge is officially released, you will be able to purchase it through me or directly from my personal website. You'll also be able to view all the images found on my website using the unique flip-book feature! You can also go visit the Cricut Blog to see more cartridge images as well as projects created with the cartridge. And look at the projects carefully...you'll also get a peek at the new Creative Memories Divine Power Palette that coordinates with the cartridge images! PS...see all the previously released exclusive Creative Memories Cricut cartridges here!